VFX Expert Srinivas Mohan has an enviable repertoire of films, known for their grand use of visual effects, to his credit. Be it Superstar Rajnikanth’s robot look in Enthiran (Robot) or the impressive effects in Shankar’s I, the National Award-winning artist has been instrumental in taking Indian VFX to the next level. In a tete-a-tete with Pandolin, the expert talks about creating a larger than life waterfall, putting together a grandiose battle sequence and much more for one of India’s grandest films, the highly-awaited period drama, Baahubali…. Vadlamudi Srinivas Murali Mohan is a three-time National Film Awards winner for his work in Visual Effects. This Vijayawada-born Telugu-speaking gentleman is known to be extremely patient, understanding and amiable. He left Vijayawada in 97 and has ever since been working on Tamil movies. Married to an Anglo Indian, he settled in Chennai. This is the first time he is working in a Telugu film (Baahubali). Cont..
Grandiose subject takes heart, says Baahubali VFX director Vadlamudi Srinivas Murali Mohan – The Hindu. @ssrajamouli . 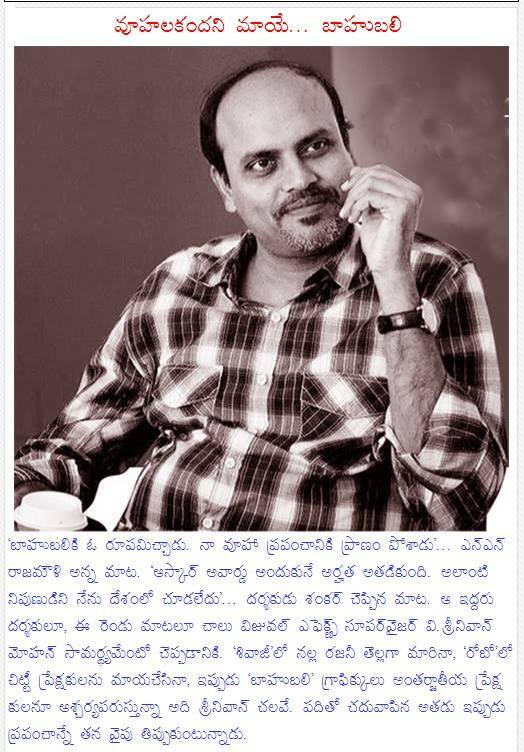 thank you sir and big thanks from our Vfx industry for giving us opportunity to be part in your epic visions. 3 years of hard work. 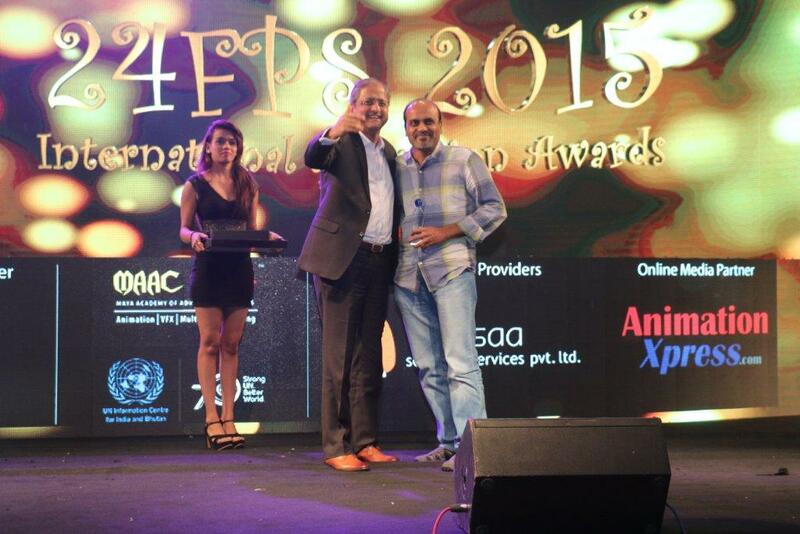 Big thanks to all VFX studios and each and every Vfx artist for wonderful work and support me to make this possible. Thanks to ‪#‎TeamBaahubali‬ for excellent support. 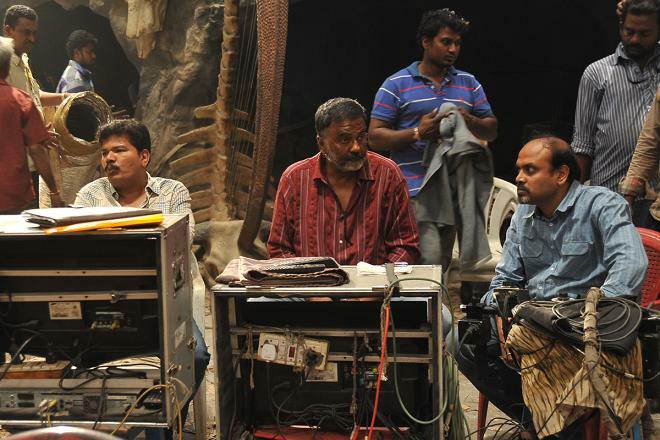 Visual effects supervisor V. Srinivas Mohan is no stranger to big-budget spectaculars, having been in charge of “Enthiran” as well other high-profile pics. He says that vfx on Indian movies can achieve 80% of an “Avatar”-like shot for one-quarter the cost. What Mohan and his team are striving for is to deliver the remaining 20% to reach global standards. Almost 90% of the film requires vfx work, with the live-action shooting augmented and expanded in post. Some 600 artists are executing the f/x at 18 facilities around the world, led by Makuta and Firefly in Hyderabad, Prasad EFX in Hyderabad and Chennai, Tau Films in the U.S. and Malaysia, and Dancing Digital Animation and Macrograph in South Korea. Two long decades in an industry that is only gaining ground now, with importance and acceptance coming slowly, but this man already has three national awards to show for his work. Having spent nearly two decades in the VFX industry in the country, he has been one of the crucial blocks in building this nascent but vital industry. Indian Artists Computer Graphics CEO Srinivas Mohan has attempted challenging projects such as ‘Enthiran’ (‘Robot’) and ‘Sivaji’ in the past. His latest outing brings has him taking his art a level higher with not just supervising the VFX but also assisting in the special make up that was required for the recently released movie ‘I’ (Ai) directed by the acclaimed personality Shankar. Shot at exquisite locations in China, the revenge movie has stunning visual effects and make up done by international houses Rising Sun Pictures and Weta Workshop respectively. In an exclusive interaction with AnimationXpress.com’s Sidharth Iyer and Vishaka Chakrapani, Srinivas sheds light on the making of the movie ‘I’, the various VFX houses involved in the process, the special make up required for the movie and the challenges that came in the way. You have been associated with many of Shankar’s earlier films. How was it working with him once again for the movie ‘I’? It was great working with him again because he is a guru in the VFX industry. He not only encourages VFX but also gives it a lot of priority and he knows it can be used well to enhance its grandeur. Shankar is very clear of what he wants and especially in the VFX industry, it is necessary to have clarity from the director. So after he locks the story, he never changes it, this helps me in working freely and also try getting good quality of effects for the movie. How did the story evolve and what were your inputs in executing it? He told me this hunchback story 10 years ago. What first struck me was that special make up would be a crucial element. I suggested Weta Workshop to him, but due to their packed schedule, it took Weta nearly six months to agree on the project after several meetings. Although I needn’t have done that as a VFX supervisor, I was able to help for the requirement. That is one big input in the film. The Mersalaayitten (Issak Taari) song VFX was done by Rising Sun Pictures (RSP). The first thought was to express Vikram’s love for Amy by making him visualise her in even inanimate objects. We didn’t want the transformations to resemble those ofTransformers (which is an easy parallel to draw). The main difference is that in this song the transitions are mechanical to organic while in that it is mechanical to mechanical. We took Amy to Australia and scanned her for the scenes and used Maya for textures. The scene where Amy becomes a fish will also drive people to think of the similarity with ‘Mystique’ from the X-Men series. In the song where Amy also takes form from sprouts, we tried to bring her up from them straight but it didn’t seem to work out; so we requested the choreographer to help in getting some spiral transformation, which looks great in the final movie. In the same song, there is a portion where Amy takes form from the water at a ‘Dhobi Ghat’ where the transformation is entirely computer generated (CG) and so is the foam that covers her body. It took a lot of time to get the shade on the foam right as well. What were the inputs provided by the various VFX houses? RSP has done eight shots in the song mentioned earlier. Initially we had a discussion on the need for such expensive transitions, but I insisted on them because without the transition, it would have looked like she is wearing a costume which wouldn’t have really worked for the amazement that we wanted people to experience. Certain scenes were pre-planned such as the Mersalaayitten song, the bee sequence, electric shock scene and the wings in the ‘Beast song’. The body hair part was attempted as special make up by Weta but they couldn’t give a lot of time for it. So it was 50 per cent real and 50 per cent CGI. Apart from the song, the Honey Bee sequence was executed by Rhythm & Hues (Hyderabad), who also helped out with the climax scene of the wide-angle flowers that were in CG. The exterior of the house where Amy is taken after being kidnapped is also done using CG, along with the bridge and a few other shots which were delivered by FutureWorks. The set extension for the ‘Beast song’, fire enhancement and the end shot of Upen Patel being electrocuted on top of the train was delivered by Prasad EFX, who have done over 50 per cent of the movie in all. Other studios that contributed to the project were: Criya – wings, hair enhancement; Makuta worked on the bloated lips and the spread of the virus shots apart from the hair growing scene; Firefly helped out with some of the train electric shock shots and a few lip sequence shots; Creative Art Concepts worked on the effects for the song ‘Ladio’ and a few climax flowers in CG and finally the roof top bicycle fight sequence was done by Lorven Studios in CG. How many VFX shots were used in the movie? About 1000 VFX shots were executed – which include the eight shots of transition, 25 to 30 shots on the honeybee sequence, 40 shots on the electric train and over 50 shots on the ‘Beast song’ – these were the major sequences in the film that require mentions. For the kidnapping house, we had a theme park where the water body existed without a bridge and we arranged for a wooden bridge to get the right lighting and then created a CG bridge and building while we shot only with trees. The ‘Aila’ song has a sequence shot against a European background which has actually been done against green screen. At the China location, the entire background is done in CG to enhance the flowers and the colours. When we went to shoot, there weren’t any flowers, so we shot with green background and then we replaced that with flowers. The climax scene also had no flowers on location, but we added them in post. What were the challenges with the fight sequences? Our main challenge was to remove the rigs. The entire roof top fight scene in China was entirely recreated and enhanced using CG. We placed a simple texture on plain flat surfaces on which they performed all the stunts and then we took care of the rest in post. The similar technique of clearing the rigs was also used for the scene where we see Vikram fighting off the goons during the Mr Tamil Nadu competition in the earlier half of the movie. How many days were spent in shooting for the major VFX sequences and adding the post production effects to them? Were you able to meet the deadlines? There are two parts for the whole movie – planned and unplanned shots. The flowers and roof top shots weren’t planned when we commenced the project, but only developed in the process as we thought it would add a whole new dimension to the scene. The planned ones were done on time and were much easily executed because of the strong previz and storyboard understanding that we already had in place. In all about 400 people have touched this film in some way or the other, and the shoot took five months on location, whereas the pre-production took a year and the VFX work took just under eight months. How was the experience of associating with Weta Workshop? What were the challenges they faced? Working with Weta is a great experience because they are clear on what they can do and what they can deliver. From the very beginning they were clear of the things they needed from us and what they can deliver. They are one of the best professionals I have seen. Makeup wise, the ‘Beast’ song took five hours to apply and two-three hours to remove. The major challenge they faced was the weather condition. Whatever they have done earlier have been in colder temperature. So when they came here, they had a lot of issues due to the make-up material notwithstanding the extreme conditions. So they had to take some assistance from local makeup artists in terms of getting some of the material locally to suit their requirements. The beast song was shot in Chennai in Prasad studios for 15 days. We didn’t get a big set. So all the floors we had here weren’t enough. The art director Nick Pill took an empty place and made a realistic set with seven cranes. He created an entire floor just for the set. It’s a huge set. On location they required one AC box constantly to keep the makeup intact, and after every take the actors had to rush to the AC box just to ensure they don’t spoil the make-up. They adapted a lot because of this condition and did an extraordinary job on the movie, which I guess is out there for everyone to witness. “He has taken visual effects to new heights. He deserves an Oscar” – Robot (Enthiran) director Shankar on V Srinivas Mohan. V Srinivas Mohan – an electrician, computer programmer, animator at different phases of his career and currently, one of India’s most renowned VFX experts. Srinivas Mohan started out from humble beginnings and is still, like any of his interviews or his own blog suggest, very humble. However, the body of work he is involved in and more importantly, the quality, is colossal. For the greatly acclaimed movie, Enthiran, Mohan tried to deliver visual effects of international standards, offering an end effect which in Hollywood would cost 4 times the budget allocated. No wonder, he is one of Shankar’s favourites. 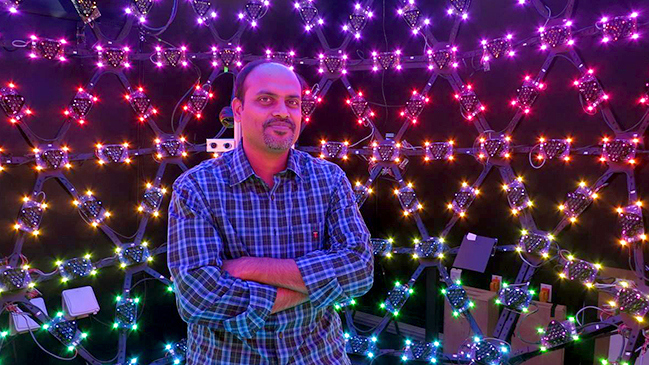 Srinivas who has initially been involved in a large number of movies in Hindi, Tamil, Telugu, Malayalam and Kannada for digital compositing made waves with the movie Magic Magic for which he was the visual effects supervisor. A VFX supervisor, for those who don’t understand, is responsible for handling the VFX project and the personnel, managing both the technical and artistic aspects of the project. As someone who is responsible for determining the most cost-effective and technically efficient visual effects techniques for a concept, Mohan scouts countries for freelancers who can offer him the best possible results. From timings, negotiations and camera set-ups, there is a lot on the VFX supervisor’s plate. Mohan has rightly asserted, with ample reason that the VFX crew is made up of artists, not technicians, as they are usually referred to. For Magic Magic, Mohan won the National Film Award for Best Special Effects. However, the juggernaut was only starting and far from reaching the dizzying heights it was destined to. Srinivas Mohan worked with Shankar on several movies like Boys, Anniyan and Sivaji. The skin grafting technique used by Mohan in Sivaji creating a digital skin, proved to be one of the keys to his success that year, earning him a second National Award. However, he blew everyone away a few years later with Enthiran, a sci-fi wonder, the ilk of which wasn’t previously seen in India, earning him a third National Award. He was also the VFX supervisor for Maatraan, a story revolving around conjoined twins, a challenging VFX project in its own right. If, 2500 VFX shots in Endhiran, was colossal, one runs out of terms while discussing Mohan’s current project, Baahubali, a period drama that is slated to have as many as 4500 VFX shots, easily Mohan’s biggest VFX budget till date. VFX producers and supervisors are responsible for a lot in movies hinged on VFX, from handling the client’s budget to getting the best work done, while collaborating with art directors and other crew on the movie sets. That doesn’t stop Mohan from being vocal about encouraging local talent pool of animators and doing his own bit for the Indian animation industry. The VFX guru will also be overseeing the work of the company Rising Sun Pictures, for Shankar’s next, the Vikram starrer Ai. Mohan who can impress you with his knowledge about Animatronix, pre-visualization concepts, current software, CG, motion graphics and other VFX elements, is also the founder of Indian Artists Computer Graphics, one of the leading Indian VFX firms, based out of Chennai, that raises bars with each project, while working on budgets as low as 1/10th of the contemporary Hollywood costs. Still young considering how much he has achieved, the accomplished VFX giant has certainly traversed an arduous journey, coming a long way from doing wedding titles to heading Indian movie industry’s biggest VFX projects. April 10th is his birthday and Releaseday Team would like to wish him a very happy birthday and even greater success and path-breaking glory in the coming years. Loaded with VFX splendor, Rajamouli’s film promises to be a visual extravaganza on an unprecedented scale. Director SS Rajamouli’s Baahubali is set to create a new benchmark for visual effects in Indian cinema. The film promises to be a visual effects extravaganza with over 4,500 VFX shots. This is a new record in Indian cinema, surpassing the likes of Shah Rukh Khan’s Ra.One and Hrithik Roshan’s Krishh 3. Set in an imaginary medieval realm, the film is loaded with computer generated imagery that promises to blur the lines between real and imaginary. Producer Shobu Yarlagadda reckons the movie will be a ‘technical marvel’. “We want to offer the audience a real visual spectacle and have been working in that direction from the outset. It’s a period drama that will transport the audience into a world of ancient forts, palaces, epic war sequences and the works. The VFX is going to be the most crucial element in the movie. We have the best national and international experts working on the film,” says Shobu. Srinivas Mohan is working as the VFX supervisor for the movie which has a slew of internationally renowned VFX artistes. Some of the visual effects are being done locally while some are being outsourced to foreign technicians around he world. Considering the scale and quality of the VFX work, the film is tipped to have the highest budget for VFX in Indian cinema. Buzz is that the budget of the film is a staggering `100 crore. However, Shobu gets a little cagey when talking about the budget. “I cannot comment on that since I don’t know about the budgets of other films. It is a very expensive film,” he says. Starring Prabhas, Rana, Anushka and Tamannaah in lead roles, the film is set for a 2015 release across all South Indian languages.